You can't get any closer to the water than this cottage. This cottage rests on a 250 foot working wharf, used by lobster men in the winter to store their traps and gain access to the water. Bring your boat with you and keep it at the float for an additional rental fee. (space is limited, call for details) You may be able to buy lobsters directly from a lobster man hauling traps in the cove. One cozy bedroom with a double bed and living room with a sleeper sofa, the cottage sleeps 2-4 people. The galley style kitchen has a 4 burner stove and oven to fill all of your basic cooking needs, or you can use the lobster cooker and grill out on the dock. The inside table seats 4, and when weather is nice, eating at the picnic table on the dock is perfect. If you are looking for a place to disconnect, unwind and relax, come soak up the sun and fresh air or watch the sun rise over Lobster Cove. Treasure hunt the shore while the tide is out or toss in a lure and catch a striped bass or mackerel for dinner. Take a trip into town for a day of shopping or an evening at the Opera House which hosts a wide variety of entertainers such as Jackson Browne, Celtic Storm, Pete Best Band, and Marty Stewart. In 1974 my parents were looking for a nice place to raise their family. They both had grown up on Lobster Cove Road. My father was a second generation lobster man. The property was perfect. They built our home across the street and began to expand the small existing dock to accommodate his lobster traps and fishing gear. For many years, he would build his own lobster traps in his work shop, which has now been completely renovated into Lobster Cove Cottage. My two teenage sons, forth generation lobster men, continue to fish their traps in the cove, (you may have a chance to see them). During the winter the dock is still used by six lobster men to store their traps and gear. My father built the dock with the help of his friends so other lobster men would continue to have access to the shore. I welcome the opportunity to share this wonderful cottage and the real Maine experience with visitors to the Boothbay Region. This could be the opportunity of a lifetime to witness a real Maine working waterfront in action. Before the first week in June, the lobster men will be working on, preparing and setting their gear in preparation for the lobster fishing season. When you rent in the early season (at our early season rates), you can see them loading their boats, and the dock becomes a busy workplace. Unlike in the summer, during this busy time before June 1st, the dock is not available for guests use, and the float becomes available in early June. Three quarter bath with corner shower makes good use of a small space. Vanity and closet offer good storage space. This comfortable cottage sits on a 250 foot dock with a float and runway. Located just around the corner from Boothbay Harbor, Sheepscot River, Damariscotta Rivers and the surrounding islands. The beds will be made for you when you arrive. There is parking on the property, with more parking available down the street. Towels are provided for each guest. Good variety of dishes and utensils. New set of stainless steel pans. We offer Hulu, for TV entertainment. Hulu is similar to Netflix, but offers TV shows . Not an actual network connection. My husband and I, and our golden retriever, just spent three wonderful days and nights at this comfortable, cozy cottage at the edge of a wharf on Lobster Cove. The views of the water first thing in the morning and last thing at night were a tranquil way to start and end the day, not to mention enjoying the beautiful starry night sky. Tucked away at the bottom of wooden stairs leading down from the street level, the cottage has a feeling of total privacy and seclusion, yet is within walking distance or a short drive to town. Lisa, the owner. called soon after we arrived to welcome us and provide helpful information, including her cell number if we needed anything. There is a park nearby where our dog was able to run. Boothbay Harbor has some great restaurants, our favorites this time being Mama D’s for wonderful breakfasts of delicious Belgium waffles, omelets, homemade muffins and scones, and great coffee (it’s also dog friendly, even inside) and Robinson’s Wharf on nearby Southport Island for superb steamers, lobsters, and other seafood. It’s a great area for art galleries as well. Perfect quiet spot with all the necessary amenities. Great location out of town but close enough to walk to. Nice and quiet location. Used the lobster boiler a couple times! There's nothing as nice as eating, fresh lobsters on the dock. Location was wonderful. The view first thing in the morning is breath taking and so many windows to enjoy. Short walk to the harbor and the village is right across the bridge. The cottage itself was adorable and provided all needs during our stay. The only negative was the mattress which needs some updating for comfort. This is a most charming cottage on the water in Boothbay Harbor. We very much enjoyed the view and beautiful sunsets over the rippling water. The location was perfect-close to downtown Boothbay Harbor and shopping, yet, on a quiet street so we could hear the seagulls and crickets. We look forward to possibly booking here again! Boothbay Harbor is an amazing place to be. Perfect location - kayaking straight from the dock, short walk to town for restaurants/shopping, biking all around Boothbay. Perfect for relaxing on the dock at all times of day. Wonderful sleeping with working windows/water views on 3 sides. Rent kayaks or other water craft from Tidal Transit in Boothbay Harbor, they will deliver them to the cottage for you. Enjoy a picnic on the shore at Barrett's Park or take a nice walk across the foot bridge to town. 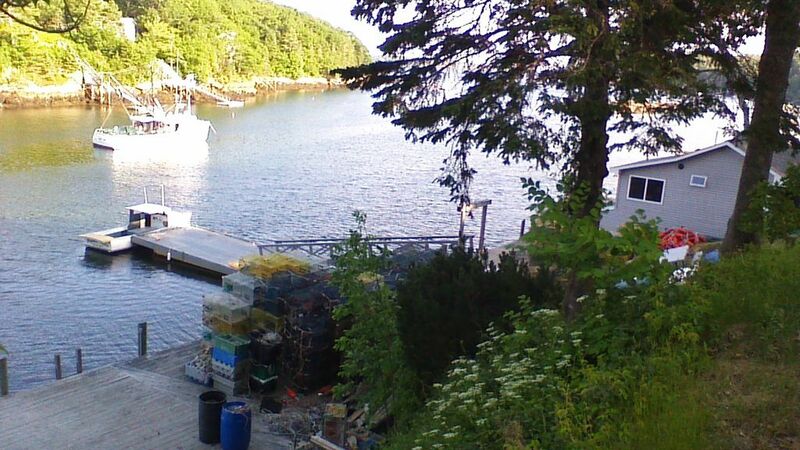 On your way back from town, stop into one of the lobster retailers, watch the lobster men unloading their catch and pick up fresh lobster to cook and eat on our dock. The cottage is just 4 miles from a world class golf course and the Botanical Garden. Take a day trip to Monhegan Island, a lobster bake at Cabbage Island, whale watching, go lobstering or deep sea fishing on a charter boat, and sailing on a sunset cruise. Our YMCA offers day passes if you would like to workout, play tennis, walk on the track or swim in the new pool. Take in a movie at the Harbor Light Cinema. Enjoy a round of mini golf and an ice cream at the Dolphin golf or take a ride on the train at the railway village after viewing their collection of antique autos. The Boothbay Region is a wonderful place to unwind, relax and disconnect from reality. Take a day trip to Freeport for a day of shopping at L.L. Bean and the outlet stores. Please call me or send an inquiry if you are interested in reserving any of the openings in my calendar that are shorter than the 3 night minimum. Thank you.